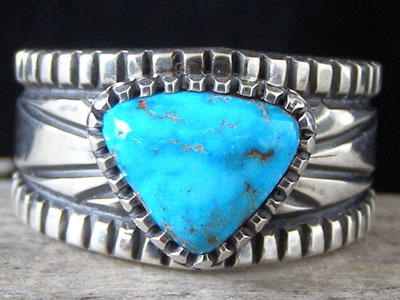 This ring is set with a soft-cornered triangle of natural, untreated Kingman turquoise in a handmade, notched bezel. Grooves radiate from the stone like rays of light. The shank tapers gently to a slightly narrower width at the back of the shank. This piece is not hallmarked, but is obviously the work of Harrison Jim as evidenced by the style and workmanship. Width of shank in front: 9/16"